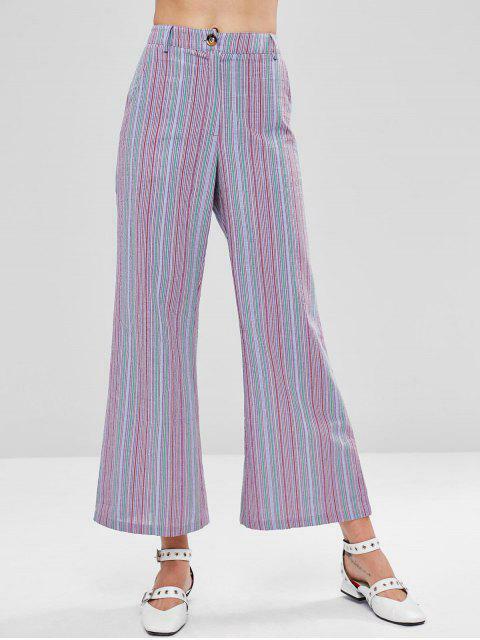 [25% OFF] 2019 Striped Wide Leg Zipper Pants In MULTI | ZAFUL .. These are soooooo cute!! The material is light and airy the colors are so cute and look great on :)) I got a medium and I’m a 4/6 in pants. The waist is kinda a big but I don’t mind cause I’ll just wear a belt. I’m veryyy pleased with the purchase!! The wide-legged pants are lovely and have been designed to make you stand out from the crowd. They have colored pinstripe all the way down them, and the look is retro when worn with a t-shirt or blouse. A hidden pocket exists on each side for holding small items. Finishes with front zip closure.